The is an emulation of the ARP Axxe synthesiser, single oscillator, noise, mixer, filter and envelope generator fully emulated in software with modulation. The app supports pressure sensitive touch screens, X/Y accelerometer for pitch and mod wheel, multitouch and zooming interface facilities. The original was a monophonic instrument however the emulator can operate as a polyphonic (duophonic) synth via multitouch when it is enabled. The interface has options for fat-finger, analogue filters and rich oscillators however these will consume extra CPU cycles. 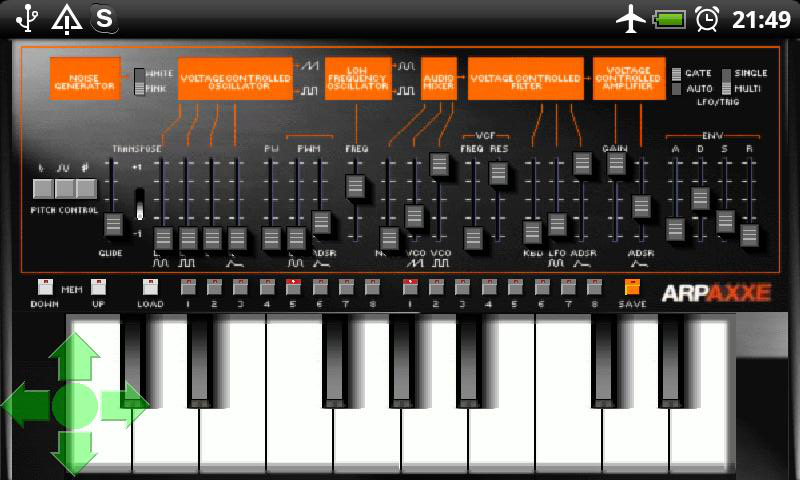 The interface also has a full piano keyboard setting. Tested on HTC Desire/2.2, Emulator hires and lowres. The Axxe is one of a family of emulators. Hi-res graphics to reduce pixel obliteration. Fixes to the recording options for tablets.